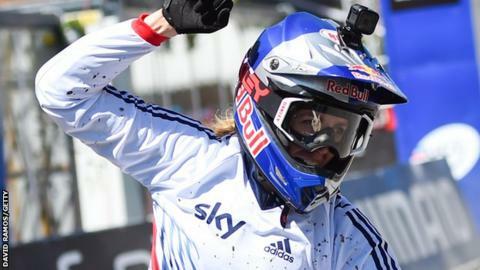 Britain's Rachel Atherton captured the elite women's downhill title for the third time at the UCI mountain bike World Championships in Andorra. The 27-year-old, who won in 2008 and 2013, also secured her fourth World Cup downhill title in the USA last month. Her latest win came in five minutes 8.488 seconds, with defending champion Manon Carpenter, the 22-year-old from Wales, 3.238 seconds behind in second. Australia's Tracey Hannah was third, with Britain's Tahnee Seagrave fifth. A jubilant Atherton said: "I knew it was going to be hard today and the track is crazy, so dry now compared to earlier in the week. "It's fast and you have to hang on. That's what I wanted this year, both titles back, and I'm pretty stoked." There was further success for Britain when Laurie Greenland won the junior men's downhill title. The 18-year-old won over the 2.5km course in four minutes 32.839 seconds.